The huertas rotos — crispy potatoes, fiery chorizo, and an oozy poached egg — at Huertas. Why: Because poached eggs belong on every single item of food. The chicken fried steak — smothered in creamy sausage gravy — at Pies and Thighs. The “South by Southwest” Benedict — served on a crispy corn tamale with pulled pork, BBQ sauce, and poached eggs — at Queens Comfort. Why: Because all food should be served like a threat: with a knife coming out of it. The cheese toast — with housemade ricotta and apple cranberry compote — at Sunshine Co.
Why: Because a cozy atmosphere and toast covered in creamy cheese and sweet-tart compote cure all ills. 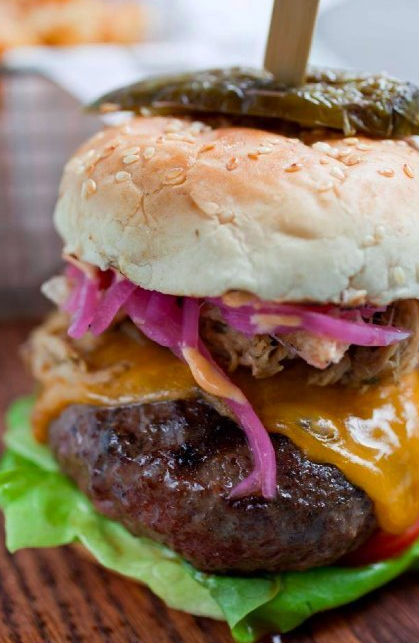 The Frita Cubana burger — complete with a sirloin patty, shredded pork, and chicharron — at Coppelia’s. The huevos ahogados — served on toast with chorizo, guacamole, and jalapeño hollandaise — at Chavela’s. The classic eggs benedict at Tartine. The croque madame — with fried chicken and ham on a bacon-smothered biscuit — at Jacob’s Pickles. Why: Because all biscuits should have bacon baked into them. The fluffy ricotta pancakes at Five Leaves. Why: Because these pancakes are topped with ~honeycomb butter~. Plus, this spot also serves Ceci Cela pastries, so you can stock up on indulgent breakfasts for the week ahead. The grilled crostino — crispy country bread served with mushrooms, Stracchino cheese, and poached egg — at Supper. Why: Because if you’re not craving crostini, you can also just order up a big bowl of spaghetti. No judgement, you guys. The classic challah french toast at La Bonbonniere. 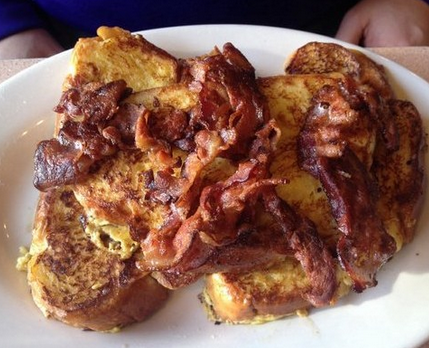 Why: Because most, if not all, brunch dishes should be topped with bacon. The tofu-scramble-stuffed breakfast enchiladas at Champs Diner. How Much: $14; other entrées $6 to $14. The Moroccan benedict at Cafe Mogador. The yuca benedictos — shrimp and yuca hash browns topped with guac, poached eggs, and cilantro hollandaise — at Yuca Bar. Why: Because an excellent brunch with Latin flare is the only thing that can lure me out of bed on a Sunday morning, and Yuca Bar’s yuca benedictos are the most successful twist on eggs benedict in the history of twists on eggs benedict. The strawberry-mascarpone-stuffed French toast — made with homemade brioche — at The Rabbithole. 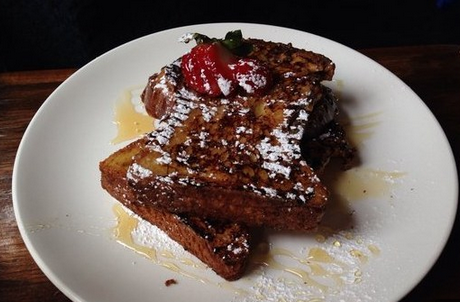 Why: Because French toast is better when the brioche is the fluffy, light, and made in-house. (I promise, the occasional twenty minute wait is totally justifiable.) If you need a snack to tied you over until your name is called, hop over to The Bagel Store to carbo-load. The baked eggs with avocado at The Smile. Why: Because eggs baked with crushed tomato sauce and manchego cheese deserve to be topped with a scoop of avocado. This dish is the food of a brunch-lover’s wildest fantasies. The Rev. Al Sharpton — perfectly fried chicken on the waffle of Leslie Knope’s dreams — at Amy Ruth’s. 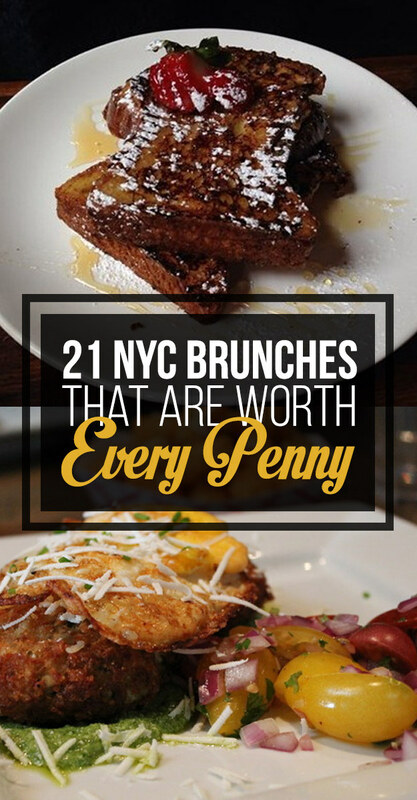 Why: Because the city’s BEST chicken and waffles (IMHO) are worthy of the trek up to Harlem. The winter hash — with black rice, baby Brussels sprouts, and squash — at Dimes. Why: Because sometimes — SOMETIMES, by which I mean very rarely — brunch food can be simultaneously healthy and tasty. Dimes’ customized acai bowls are popular and surprisingly delicious. The Nutella-stuffed french toast at Penelope. 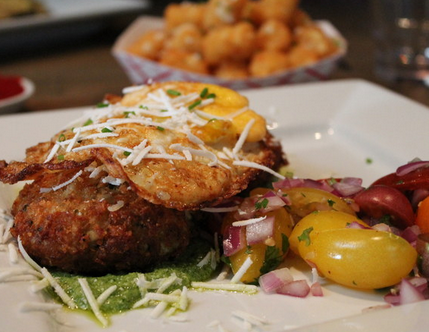 The fried-egg topped crab cakes at Verboten. Why: Because it’s not a real Williamsburg brunch unless it’s in a warehouse. Literally everything at Nom Wah Tea Parlor.